Still looking for Stocking Stuffers? It was a great pleasure meeting with Jackie Rowe, owner/operator of The Garlic Box in Hensall recently. It was right in the height of “scape” season, so I learned a great deal about this highly nutritious spring vegetable and about growing garlic in Ontario. Ontario garlic is much different than what’s imported from other countries. It’s known as a cool-season crop, planted in the fall and harvested ten months after in late summer. It’s a root-to leaf crop, meaning that all parts of the plant are used. Garlic comes out of the ground wet, with a distinctive Ontario flavour profile described by Jacquie as “the right amount of heat, sweet and nutty” Like wine, garlic develops a taste of terroir – Ontario’s garlic described as having a lingering mineral finish. You’ll find imported garlic has much more heat – a sharper taste that might burn on your tongue – as it’s planted for just four months. Garlic grown outside of Canada does not produce the scapes, either. 75% of Canadian garlic is grown in Ontario, followed by large crops in Quebec and a smaller market can be found in British Columbia. The BC crop has a distinctively different flavour as it’s grown in volcanic ash. Jacquie started growing Garlic in Stratford in 1997, expanding to one acre and branding as The Garlic Box in 1998. Since that time she has been a huge advocate for Ontario Garlic, touting it’s distinct flavour and promoting it’s health and nutritional benefits. Originally she had hoped to be a Seed Company for Ontario Garlic, but by consumer demand that soon changed, although she says “the local movement is just now gaining great traction, during the first fifteen years of pounding the pavement no one really cared.” And although she feels like she is still educating consumers, she’s come a long way since her one-product stand at the St. Mary’s Street Festival where she sold garlic jam. The farm has expanded to three acres (each acre produces 4-5000 lbs) and this business buys garlic from local mennonite farmers to manufacture 30-50,000 bushels per year. It requires manual labour to harvest and just-in-time processing. The Company employs five full-time staff, seasonal workers that do the field work, three sales representatives and two distributors. Sixty-five percent of the packing is done right at their business in Hensall, as well as 100% of the shipping. The Company had an extensive relationship with producers in Scotland when they helped set up a garlic industry as part of a field-to-fork food movement there. We share a similar climate. They still ship some products to Europe, primarily Germany, Sweden and Scotland, but prefer to focus on the Canadian market – primarily selling wholesale to the food service industry. Products are also available online or in niche markets like Jill’s Table in London, who has been a faithful fan since Jill discovered The Garlic Box at the St. Mary’s Street Festival. At the Garlic Box they are environmentally conscious. With success of a recent application to the Local Food Fund, The Garlic Box hopes to retrofit to expand house capacity at their site in Hensall. In the spring, a tall flower stalk, the scape, is harvested for its highly nutritious value. Garlic scapes are tender coils on the plant, much like a fiddlehead. There is just one per plant and they are hand snapped during a two-day harvesting window. They can be pickled, diced or dehydrated. You can also eat seed poppers from the purple flowers on the scapes. Stems and leaves are chopped at the Garlic Box for flavourful vegetable stocks. And the most recognized part of the plant is the bulb – a versatile vegetable that can be grated, steamed, poached, fried or roasted. One garlic bulb has six cloves. By supporting The Garlic Box you are supporting the local agricultural industry as they use local honey, apple cider, cranberries and peaches in their popular products that include balsamic vinagrettes, sauces, salad dressings and seasoning for soups and baked beans. The newest product – frozen garlic is up for the Ontario Premier’s Award this year. It’s apparently “the best thing since shelled peas.” The bulbs are peeled, then flash frozen and highly branded for year round sales. Frozen garlic maintains its nutritional value and is sold in 20lb boxes – a great convenience for the food service industry. Jacquie is always working on new recipes too – check out the website for some holiday favourites. Mushroom Appetizers popular party fare! Here is an Asian twist on stuffed mushrooms. Chinese plum sauce and sesame oil make the satisfying, intensely flavored glaze. Small portobellos can be substituted for the shiitakes, if you like. Preheat oven to 400°F. Bake mushrooms until sausage is cooked through, about 15 minutes. Transfer to large platter. Sprinkle with chives. Recently I had the pleasure of meeting Susan Weth, co-owner of Weth Mushrooms. I was surprised that mushrooms there are not grown in the dark, and they are not grown in horse manure. These mushrooms are grown in a “Natural” mixture that is wood-based, as these farmers try to replicate the forest floor as a growing condition for their mushroom crops. 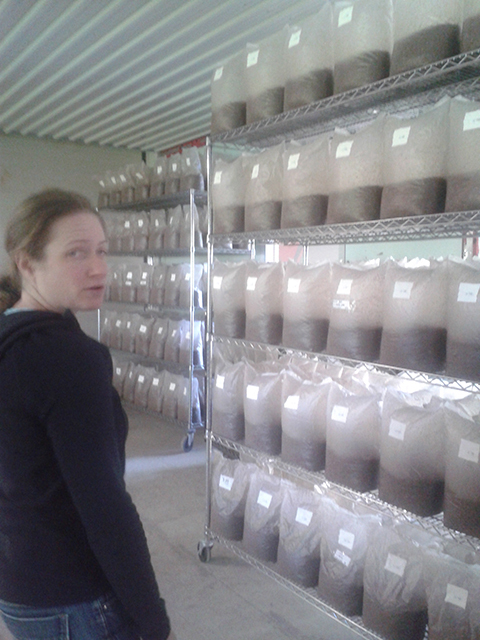 At Weth Mushrooms, a new crop is incubated every 10-12 weeks. They’re planted in plastic bags in that special mixture of soil, grain and sawdust that eventually hardens and colourizes (Incubates), at which stage the bags are removed. Within one week the mushrooms are sprouting in temperature and moisture-controlled sprouting rooms. Once harvested the block-growing material is composted back into the field. Although there are bio-security issues in certain parts of the plant we were invited inside. There are three brands of mushrooms grown at Weth’s. Susan’s favourite brand grown here is shiitake, so much so that she no longer uses the very popular white button mushroom, and uses Shiitake in “everything”. Shiitake mushrooms are not native to Southwestern Ontario. The second type, maitake, can sometimes be found in Huron County, growing in the wild. It has a nutty flavour. And, the third type, pioppino is a small brown variety that has a bit more texture and remains slightly crunchy even after cooking. Maitake and Pioppino mushrooms grow faster than the Shiitake, but temperature changes can wipe out a crop quickly. Susan tells me she prefers maitake fried in olive oil and butter until the tips brown. Shiitake are flavourful in omelettes, stuffed with roasted red pepper and goats cheese or marinated and barbecued. Pioppino’s are nice in stews or stir fried dishes. All three have good meaty textures and are an excellent substitute for meats. Mushrooms are loaded with anti-oxidants. And, to my surprise, Susan does not eat or serve mushrooms uncooked as they do have some toxins. In some cultures, mushrooms are used raw for cleanings, but Susan does not recommend using them this way. Mushrooms are shipped from this site every week and many local restaurants buy direct from the farm. Susan indicated their future would likely include more varieties and increased yield. As Weth Mushrooms are organically grown, their product is popular, especially with growing consumer demand for organic produce. For the most part the Weth’s can’t keep up with that demand as mushroom farming is extremely labour intensive. Picking or harvesting is all done by hand, and although there is no grading system in Ontario Weth’s internally grade and price their product as premium, utility and baby. Weth Mushrooms is iocated on 89 acres of reforested land in the Township of Central Huron. They’re open to the public Monday through Friday from 9 until 3:30pm or by appointment. Tours are sometimes available so call Susan for more information. Are Rutabaga’s on the Menu this Holiday season? My favourite side dish with turkey or beef is rutabaga … and, apparently, it’s a really healthy choice. Last spring we met with the Hubbard Family in Blyth to learn about their business. George Hubbard started a family business, G.L. Hubbard Ltd., in 1962 when he purchased the plant located on Dinsley Street East in Blyth from Russ Dougherty. The rutabaga is a root vegetable with a yellow flesh. It is a cross between a turnip and a cabbage. It reported originated in Scandanavia or Russia and was first found in North America in the early 19th century. They are served a variety of ways in many countries, but in Canada they are most often used as filler in mincemeat and Christmas Cake or served as a side dish. Rutabaga are planted 6” apart, and only 12 acres had been planted when we visited this producer on May 13, 2014. 2013’s extremely long winter delayed the planting season this spring. Plans were being made to plant another 12 – 17 acres in the couple weeks following, with planting all finished by the end of June. The rutabaga is a 90-day crop and harvest begins in October, taking approximately three weeks to complete. The rutabagas are pulled in the field by a harvester, trucked into the plant and unloaded via stackers to prevent bruising and cracking. They are kept at 33 degrees in a humidity-controlled room and about 50,000 bushels are stored in the two on-site storage sheds. There are two more sheds off-site. Each week this plant processes 2,000 – 4,000 bushels, depending on the market – typically less in spring and more in fall and winter months as that’s when the harvest take place and when the consumer demands this tasty root vegetable. Buckets on a tractor transport the rutabaga from the storage shed to a wash station. Rutabagas are then washed twice. Hubbard Farm is still using its original washing equipment. Rutabagas travel, via an auger, into a holding bin where they drop to be trimmed and sized/sorted by hand. Trimming is done only for esthetics. The next step in the processing is waxing – a process that requires six people. And, finally, stickers with Foodland Ontario’s bar codes are applied and the rutabaga are boxed in 50lb boxes for shipping. Hubbard’s ship every day with Friday being their biggest day to accommodate shipping schedules into the United States. They have enjoyed a long term partnership with Stovel Siemon of Mitchell for shipping their products across Canada and into the U.S.
Yearly inspections are required at Hubbard’s for food safety standards. It is a year-round business with down-time in July for repairs and cleaning. A recent new shed was erected on the property to meet food safely requirements. It houses packing cartons and skids. This operation currently keeps six families in Canada and seven immigrant families employed including two of George’s daughters, his son and one of his grandsons. Many of the immigrant families have other jobs in their native Jamaica such as driving a taxi, farming, and building furniture. Since 1988, foreign workers have been a part of the Hubbard Farm with nine arriving each spring, rising to 13 each fall. Rutabagas are high in Vitamin C. I asked Susan Hubbard what the most intriguing recipe she’d heard of and she responded “Cheese Whiz and mashed rutabaga” – I guess I should try it that way too, although I find it most delicious mashed with a little browh sugar, salt and pepper, and slathered in gravy. It can also be served with apples. If you haven’t tried Rutabaga put it on your bucket list. It can be purchased year round at most grocery stores, or direct from the plant at 367 Dinsley Street during business hours. Sadly, shortly after our visit at Hubbard Rutabaga plant last spring George Hubbard passed away. He will be missed by his family and many friends and neighbours in Huron County and beyond. His family will continue to operate the business and farms. It’s that time of year when turkey is on everyone’s mind … and fork, so I thought it would be a great time to share this story about Hayter’s. Enjoy! Since 1984 this family-owned turkey farm in Dashwood is the place where the Hayter family has developed its passion for premium quality. Their devotion to taste and tradition in every aspect of turkey farming and turkey products continues through three generations and was evident when we met with Joanne recently. This family decided to raise turkeys because their land was poor and they found that turkey manure proved to be the best fertilizer. They had farmed beef and cash crops until 1993. The Hayter’s have 13 barns and this is only turkey farm in Huron County that also has the processing plant. Hayters Turkey grow poults from one day old until they reach average market size of 35lbs, taking toms up to 16 weeks. The hens go to market at 13 weeks at about 18 pounds. Hayters raise 160,000 turkeys per year on their farm in South Huron. Their onsite store was built in 1983 and has been expanded a couple of times since, although the Hayter’s have had a farm outlet for 50 years. The more recent addition of the LCBO agency store brought increased notice of their products, particularly with the summer market travelling to the lakeshore. Easter, Christmas and Thanksgiving is still the biggest sales opportunities for fresh turkeys. To expand their market, further processing was needed to meet the needs of a time-challenged consumer. Thus, turkey sausage, schnitzel, marinated fillets, wings and drumsticks, and burgers were added to their product lists. Also offered through the store are frozen and fresh turkey products and condiments. Hayter’s Turkey products are labelled with the Foodland Ontario brand. Hayters Turkey employs 70, including 5 extended family members. Joanne’s brother Tom earned an animal poultry science degree from Guelph. One son heads the marketing division in Toronto. Joanne told us that they do ship to western Canada, but currently have no interest in the US market. And, they attend farmer’s markets seasonally in North Bay, Sudbury and Sault St. Marie. A quota system for raising turkeys came into effect in 1970. However, the Hayters Farm was a significant size at that time so that percentage of their quota doesn’t cost. 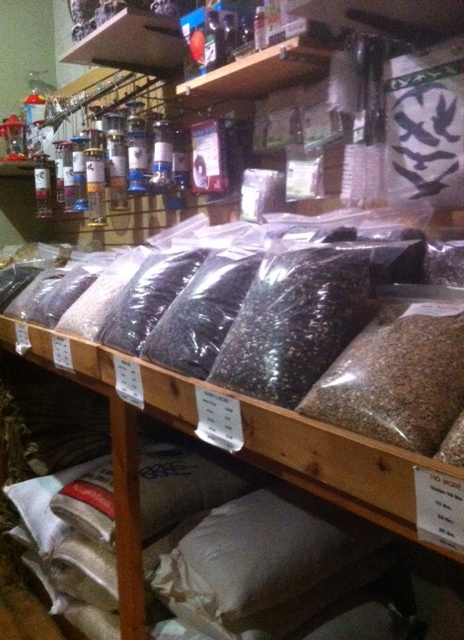 In Canada, farmers can’t grow more than 50 birds without a quota. The processing plant at the Hayter Farm is provincially regulated. Regular Inspections are deemed “necessary” as this family feels it is vital to promoting the message that their products are safe and healthy options. Joanne feels they do have a voice but it’s difficult to advocate for change and to keep ahead of the ever-evolving health requirements while operating this size of business. Joanne’s favourite product is the marinated fillets, and she wants everyone to know how healthy turkey is with just 2% fat in the breast. Breast up – 450 degrees for 1/2 hour uncovered; then 2 – 2.5 hours at 350 covered. Check the website for virtual tours of their farm – coming soon! Starting at $105 per person. Package includes a $50 dining credit for Samuels, a winter welcome package in your guestroom, overnight accommodation and breakfast for two. I am still enjoying the relaxed feeling that I instantly had upon entering the front lobby of Samuels hotel, located just outside of Goderich, for the Snowflake Getaway with my husband this past weekend. As parents to three busy kiddos we always say to each other that we need the chance to get away and spend some time without the kids but rarely do that. This package from Samuels provided just what we needed to relax and enjoy some “us” time with out being called “mom and dad” for a bit. The package included accommodation with a welcome gift, $50 voucher towards our dinner from the bistro menu and breakfast. 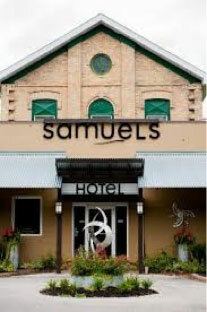 I have enjoyed cooking classes and dinners out at Samuels but I never had the opportunity to stay overnight. The owners, Hugh and Kim Burgsma, have created a beautiful 13 room (plus the school house suite) boutique hotel that one would expect in a big city and made it available to visitors to Ontario’s West Coast. We were greeted by the friendly front of house staff member, Sarah, and felt very welcomed. The large Jacuzzi room was nicely furnished and very clean. The view from the terrace was of the beautiful Maitland River and provided a wonderful sunset as we enjoyed a pre-dinner drink in our room. As the weather was cooler, we took advantage of the fireplace in our room to add to the relaxing atmosphere. 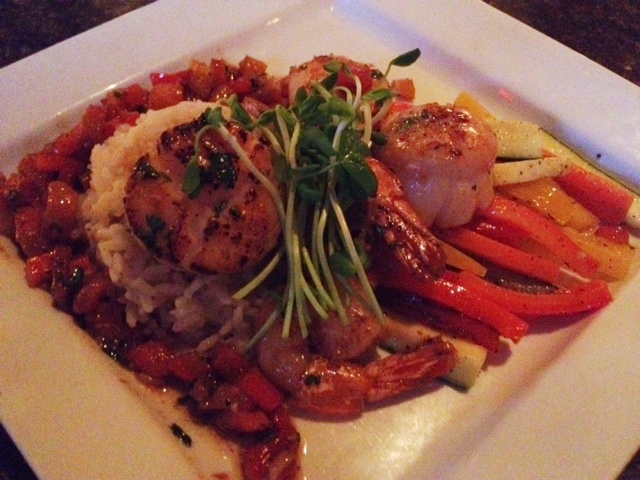 We enjoyed a fabulous meal from the Bistro menu along side other guests by the stone fireplace in the dining room. We started with the baked Brie with berry port compote and French Onion soup, which was the perfect start to our dining experience. Our mains included a smoked pulled-pork wrap (a favourite of my husband’s) and coconut curry prawns with basmati rice, which was beautifully scented. And, the servings were very large! We decided we could not turn down dessert and shared a mouth-watering brandy baklava that was served with warm crème Anglaise. YUM! On our way back to our room we stopped to pick up a DVD from the collection available to guests to watch back in our room. It was nice to be able to have access to a wide variety of titles, along with several books that are free to borrow. A variety of snacks and beverages are also available for guests to purchase. I took advantage of the beautifully large Jacuzzi tub and enjoyed a nice long soak with some wonderfully scented bath salts that were provided in the room. Afterwards we cozied up on our bed to watch the movie. It is so nice to have a DVD player in each room. After an amazing long sleep in the comfy bed, we ventured out into the dining area for our breakfast, which included a continental buffet of cereals, fruit, yogurt, breads and pastries, juice and coffee as well as an item off the hot breakfast menu. My husband enjoyed the Caramapple crepes (so good) and I had the Belgium waffle with fresh berries. Service was, again, excellent – as was the food. I would highly recommend the Snowflake Getaway package at Samuels. They really understand hospitality and treated us like valued guests. It is in a great location for exploring all that Goderich and area has to offer this winter – from snowshoeing and cross-country skiing on the trails to shopping at the many excellent shops in the downtown square! Why not book yourself some time with friends or your partner and enjoy all that Samuels and Ontario’s West Coast has to offer?! Starting from $203 per two people/ Includes a special gift ($20 Value) awaiting your arrival, Overnight Accommodation, $50.00 in restaurant credit. Looking for a unique way to warm up this winter, I treated my mother to a snowflake stay package at Oakwood Spa and Resort. The staff were warm. 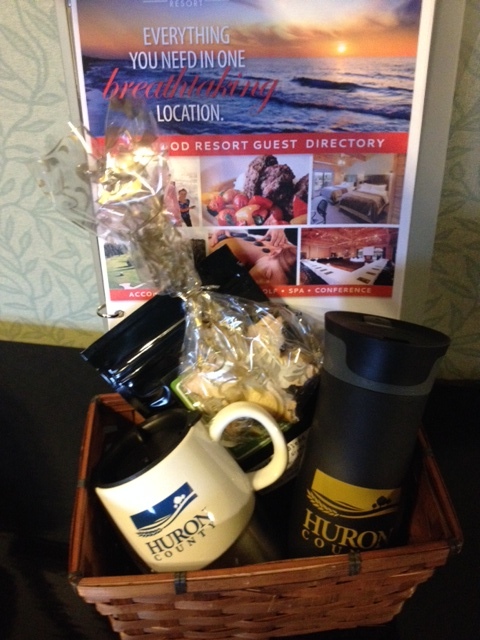 We made our way to a wonderfully spacious suite and opened up our welcome basket containing Huron County treats. Our room was stunning and the two fireplaces and the pine finishes were the perfect setting for some mother/daughter time. I’m a bit of a boutique hotel junkie and have to say that I was very impressed with the waterfall bathtub and rainfall shower that came with the suite. After enjoying a walk down to the private beach, a soak in the indoor hot tub and saltwater pool, we made our way to the Oakwood Pub for dinner. The decor of the Oakwood Pub was beautiful and tastefully decorated. The crowd was a lively mix of all ages; a table of women in their 20s enjoying a girls’ night, couples mingling at the bar and a few seniors out for a Friday night meal together. The ambiance was lovely – enjoyable background music and soft lighting seemed to put everyone in a jolly mood. We were handed the specials and regular menu and it was pretty hard to choose a dish as they all sounded amazing. I ordered “The Snow Man Beef and Noodles” while my mom ordered the “Ocean Jewels” off the traditional menu, neither of us were disappointed. 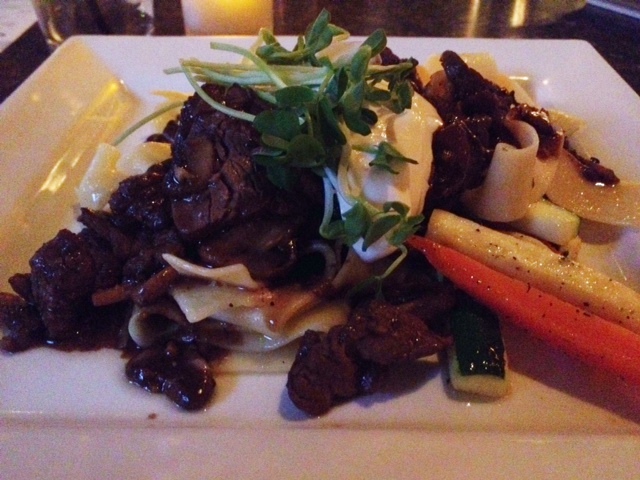 My Ontario raised- grain-fed beef was delicious and the papperdalle noodles were perfectly cooked. The addition of sour cream and green pea shoots complimented the mushroom, red wine and demi-glace nicely. My mom said the scallops and shrimps were perfectly cooked. She loved the lemon rice that came with the dish and veggies reminded her of the way my grandma used to cook them. 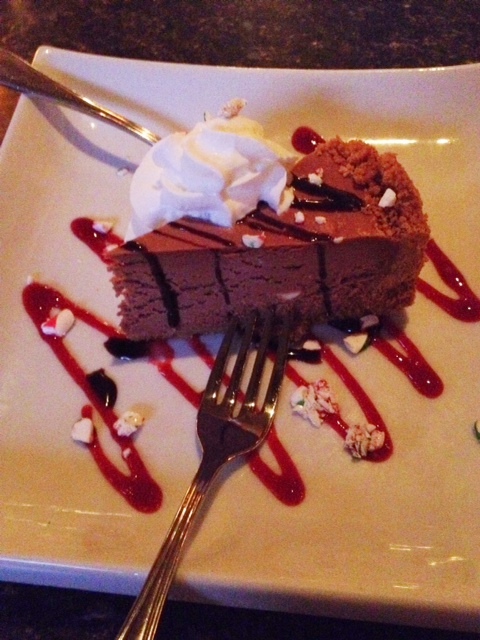 We were definitely satisfied but could not give up the temptation of sharing the Candy Cane Cheese Cake – a chocolatey and creamy piece of joy. The night ended with girl talk by the fireplace while we enjoyed the complimentary coffee and teas that awaited us back in the room. After a refreshing sleep we made our way to the Oak Room Dining Room for a hot breakfast buffet overlooking the Oakwood grounds. The experience of the Snowflake Stay Package at Oakwood Spa and Resort was a wonderful way for my mother and I to connect, recharge and unwind before the excitement of the holiday rush. If you are looking for a special way to treat your mom (or another loved one) to the warm spirit of Huron County, I would highly recommend a snowflake stay package at Oakwood Spa and Resort.